Matthiola R. Br. in Aiton, Hort. Kew. ed. 2. 4:119. 1812. nom. cons. ; Benth. & Hook. f., Gen. Pl. 1:67. 1862; Boiss., l.c. 146; P. Conti in Mem. Herb. Boiss. 18: 1-88. 1900. Chemysk. in Kom., l.c. 285; Cullen in Davis, l.c. 447; Rech. f., l.c. 228. Annual or perennial, often shrubby herbs, erect, branched, often densely pubescent with branched or stellate hairs, rarely glandular or subglabrous. Leaves pinnatisect to entire, usually oblanceolate to ovate; lower stalked, upper stalked to sessile. Racemes lax, few to many flowered. Flowers usually large, white or pinkish; pedicels usually short, ± thickened in fruit, erect or ascending. Sepals erect, inner saccate at base. Petals usually about twice as long as the sepals, long-clawed, linear to oblong-obovate. Stamens 6, filaments without appendages; anthers often linear, acute. Lateral nectar glands various, often in pairs, each semi-lunar, often fusing together, with or without basal process; middle glands absent. Ovary oblong, many ovuled; stigma bilobed, subsessile or sessile, lobes erect, rarely with lateral appendages. Siliquae often long, compressed with sub-convex valves, often subtorulose, bilocular, dehiscent; valves with a distinct mid-vein, ± pubescent, rarely glandular; septum not veined; seeds many, suborbicular, often narrowly winged. Nearly 60 species, chiefly in the Mediterranean region and Asia, some in S. Africa; only 5 species (incl. 2 cult.) recorded from our area. Matthiola chenopodiifolia Fisch. & Mey. Matthiola incana (Linn.) R. Br. Matthiola tristis (Linn.) R. Br. Cheiranthus incanus Linn. = Matthiola incana (Linn.) R. Br. Cheiranthus tristis Linn. = Matthiola tristis (Linn.) R. Br. Matthiola annua Sweet = Matthiola incana (Linn.) R. Br. Matthiola flavida var. integrifolia (Kom). O.E. Schulz = Matthiola flavida Boiss. Matthiola integrifolia Kom. 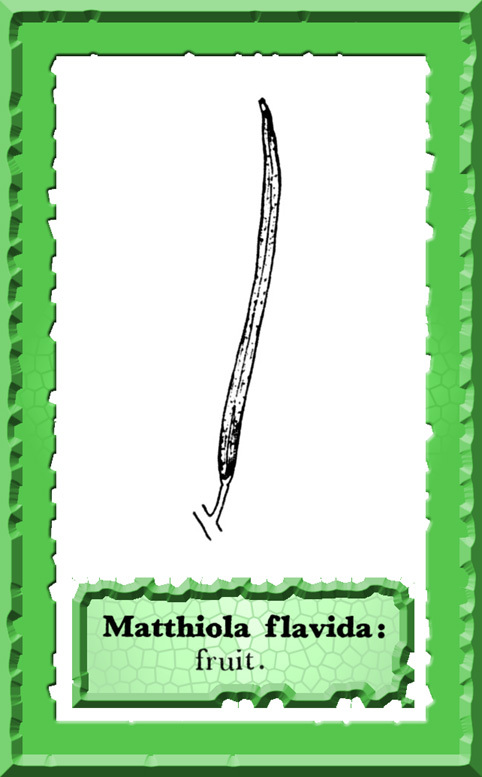 = Matthiola flavida Boiss. Matthiola odorata var. stricta Conti = Matthiola flavida Boiss. Matthiola odorata var. thibetana Conti = Matthiola flavida Boiss. Matthiola odoratissima auct. non (Pallas) R. Br. = Matthiola flavida Boiss. Matthiola porphyrantha Rech. f., Aell. & Esfand. = Matthiola chenopodiifolia Fisch. & Mey.